Eating a well-balanced diet of proteins, carbohydrates, fats, seasonal fruits and green vegetables in proper proportions is necessary for the proper functioning of the digestive system. The reason we eat and drink should be to create enough heat in the body and satisfy the tastebuds.There are six tastes: 1. sweet; 2. salty; 3. sour; 4. hot (chilly); 5.astringent; and 6. bitter. The astringent and bitter tastes are mostly avoided. These two tastes increase the digestive power (the "fire"), and are like a starter in a car; they should be included in our diet. They nullify the effect of sweets and purify the blood. We must always be aware of the after-effects of the food and drink we take. We should see that the "fire" in the stomach is well maintained, so that normal food is digested. After the age of 35, we should know what type of food creates disturbances, and avoid it. A particular food may be good for certain people, but unsuitable for others. For example, curds/yoghurt are agreeable for people having more element of "fire", but not suitable for people having more element of "water" in them. In ayurved, the Indian medical system, a detailed description of the after-effects of the different cereals, vegetables, spices, fruits, milk, curd, buttermilk, herbs, minerals, etc., is given. This covers what food to eat, how to eat it, when to eat it and the effective use of kitchen spices in curing certain diseases. For example, one of the many important kitchen spices is turmeric. It is an antiseptic and can be used on cuts and burns. It stops bleeding, and heals. It is also used on swollen joints and for bone pain. The powder is boiled, and a thick paste has to be applied for three to four days on the part that is in pain. It is also a blood purifier, and can be drunk with milk. It is given to mothers after delivery to help tone and contract the inner organs. 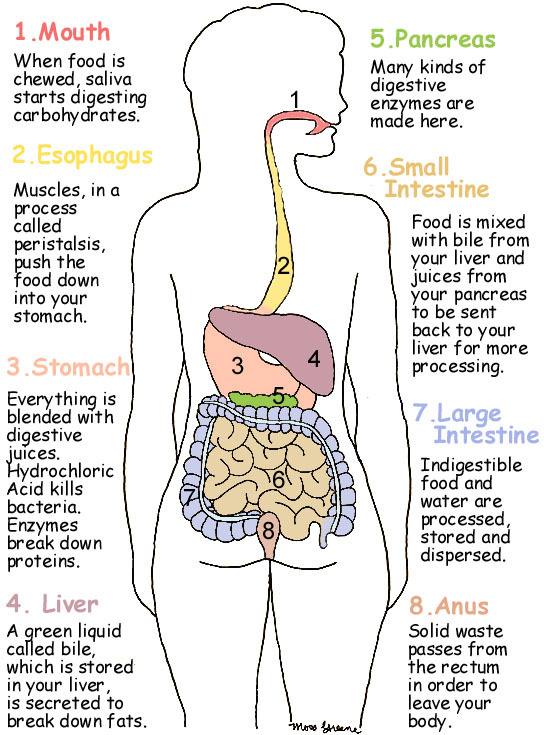 There are some simple conditions that one should follow to maintain a good digestive system. 8) The stomach should be given a rest by eating fruits and drinking fruit juices once or twice a week, or substituting a meal or two with fruits and fruit juices. To satisfy your tastebuds is one of the greatest enjoyments in life for many people, but eat what you like once in a while in moderation, and respect Nature's signal to stop when the stomach is full. If your digestive power and eating habits are good, you will feel energetic, light and capable of work - even running if necessary after a meal. If you feel heavy, sleepy or dull, it indicates overeating or fast eating, or a weakened digestive system. Foods like ginger, pepper, bitter foods, exercise, etc., helps the "fire", while cold water, cold drinks, ice-cream, etc., reduces the "fire" and increases the burden on the digestive system. Life is heat; death is cold. Eat and drink accordingly. There is a simple acupressure exercise that can be done for the digestive system with the aid of a foot roller. Roll the feet on the foot roller, each foot for five minutes. 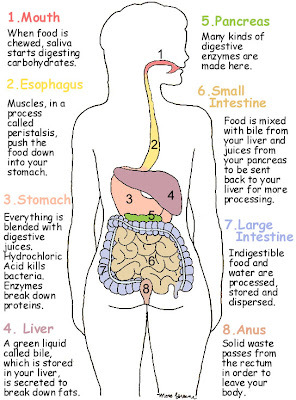 This activates all the organs of the digestive system. This is very helpful for people over the age of 40.